Draft: 2015, Atlanta Braves, CBBth rd. Pitched for three seasons at Texas A&M University ... Went 5-0 with a 2.00 ERA (13 ER/58.1 IP) over 56 appearances (four starts) during his collegiate career...Moved from the bullpen to the starting rotation for his junior season in 2015, going 2-0 with a 0.43 ERA (1 ER/21.0 IP) across four starts to open the year before undergoing season-ending surgery ... Following his sophomore season he appeared in nine games out of the bullpen for the USA Baseball Collegiate National Team, posting a 0-0 record with a 0.00 ERA, striking out 10 in 12.1 innings. In his first major league season, worked at the back-end of the Braves bullpen and finished with 15 saves, one off the team lead of RHP Arodys Vizcaíno ... Since the save became an official stat in 1969, 2018 marked just the second time the Braves had two different players record 15 saves…RHP Greg McMichael had 19 and LHP Mike Stanton had 27 in 1993 ... Minter's 15 saves were second most among rookies in the majors, just one short of Philadelphia's Seranthony Dominguez...Minter's 15 saves were the most by a rookie left-hander since 1975, when Will McEnaney saved 15 for Cincinnati ... Also had 12 holds, becoming one of four pitchers in the majors with that many holds and at least 15 saves…Joined Jeremy Jeffress, Joakim Soria and Seranthony Dominguez ... Made 65 appearances, the fourth most in franchise history by a rookie left-hander…Jonny Venters set the mark with 79 in 2010 ... Led all major league rookie lefties this season with his 65 appearances ... Allowed 16 of his 22 earned runs at SunTrust Park...Went 2-0 with a 1.88 ERA (6 ER/28.2 IP) and converted 10-of-11 save chances in 31 games on the road ... Batters hit .297 (19-for-64) against him with runners in scoring position, including .324 (11-for-34) in such situations with two outs...Allowed a .208 (11-for-53) opponents' average with no runners on and no outs ... Walked 3.2 per nine innings, but compiled a 3.38 ERA (7 ER/18.2 IP) in appearances with a walk… Had a 3.16 ERA (15 ER/42.2 IP) in his 46 games with no walks ... Among National League pitchers with as many innings as Minter, his 0.44 HR/9 rate was eighth best…Allowed three total home runs, all on the first pitch of an at-bat ... In at-bats that started 0-1, the opposition hit .258 (31-for-120) against Minter…When starting the at-bat with a ball, Minter limited the opposition to a .169 (15-for-106) average ... Appeared in two games of the NLDS vs. LAD, and tossed a scoreless inning in each. Made his major league debut and finished the season in the Atlanta bullpen after spending time across four levels of the Braves minor league system to open the year... Began the year with Single-A Florida and made one appearance before going to the disabled list with left forearm nerve inflammation…Missed all of his first major league Spring Training camp with the same injury... Made his MLB debut on 8/23 vs. SEA after the organization selected his contract from Triple-A Gwinnett earlier in the day…Struck out two in a perfect ninth inning and became the first member of the organization's 2015 draft class to reach the majors... Did not issue a walk in his first 13 career games... No other Braves pitcher in the modern era (since 1900) issued zero walks through the first 10 games of his career...Ian Thomas was the only other pitcher to go nine straight...According to the Elias Sports Bureau, Minter's streak was two games shy of the modern major league record... SF's Hunter Strickland began his career in 2014- 2015 with 15 games without a base-on-balls... Issued his first walk and took his only loss on 9/26 at NYM... Finished the season having struck out at least one batter in his final 12 games…Of the 45 outs he recorded, 26 came by strikeout...Fanned a season-best four in his final appearance of the season, 10/1 at MIA... Had a 15.60 K/9 ratio and his strikeout per batter faced mark was .433…As a reference, only three qualifying relievers in history have reached those marks in the same season…Aroldis Chapman in 2013 and 2014, Craig Kimbrel in 2012 and 2017 and Kenley Jansen in 2011... His 26 strikeouts were the second most through a reliever's first 16 games in Atlanta franchise history…Only Craig Kimbrel had more with 31... Major league lefties hit .190 (4-for-21) against with no extra-base hits... Split his minor league time between Gwinnett (AAA), Mississippi (AA), Florida (A+) and Rome (A), combining to go 1-2 with a 3.33 ERA (9 ER/24.1 IP) and 30 strikeouts over 26 games... Reinstated from the MiLB disabled list on 6/12 and tossed a perfect inning for Florida, striking out all three batters he faced on 12 pitches... Moved to Single-A Rome on 6/16 for one outing before returning to the Fire Frogs…Made his Double-A debut on 6/28…After three scoreless outings with the M-Braves, transferred to Triple-A on 7/4 where he remained until his selection to the MLB roster... Went 1-0 with a 1.00 ERA (1 ER/9.0 IP) over his last 9 games with GWN after going 0-2 with a 9.95 ERA in his first 8 appearances with the G-Braves...Pitched back-to-back days for the first time in his career, 7/23 and 7/24…Did not pitch on consecutive days at the MLB level. Made his professional debut, pitching out of the bullpen for three different levels of the Braves organization as he recovered from "Tommy John" surgery in March of 2015…Did not pitch on consecutive days all season ... Made 31 combined appearances, compiling a 1.30 ERA (5 ER/34.2 IP), a .149 (18-for-121) and 47 strikeouts…Gave up three extra-base hits total and no runs in 29 of 31 games ... Began the year with Single-A Rome, making his professional debut on 5/5 vs. Hickory in Game 2 of a doubleheader ... Advanced to Single-A Carolina on 5/19 and debuted for the Mudcats on 5/22…Struck out four over 2.0 scoreless innings that day at Wilmington ... Made his Double-A debut on 7/5, striking out two over 1.2 innings vs. Montgomery ... Struck out at least one batter in 16 of his 18 regular season appearances with Mississippi… Fanned 12 consecutive batters, 7/9-22 ... Made three scoreless postseason appearances for the M-Braves. April 4, 2019 Atlanta Braves activated LHP A.J. Minter from the 10-day injured list. March 28, 2019 Atlanta Braves placed LHP A.J. Minter on the 10-day injured list retroactive to March 25, 2019. Left shoulder inflammation. August 23, 2017 Atlanta Braves selected the contract of LHP A.J. Minter from Gwinnett Braves. July 4, 2017 LHP A.J. Minter assigned to Gwinnett Braves from Mississippi Braves. June 27, 2017 LHP A.J. Minter assigned to Mississippi Braves from Florida Fire Frogs. June 17, 2017 LHP A.J. Minter assigned to Florida Fire Frogs from Rome Braves. June 16, 2017 LHP A.J. Minter assigned to Rome Braves from Florida Fire Frogs. June 12, 2017 Florida Fire Frogs activated LHP A.J. Minter from the 7-day disabled list. April 13, 2017 Florida Fire Frogs placed LHP A.J. Minter on the 7-day disabled list. April 11, 2017 LHP A.J. Minter assigned to Florida Fire Frogs. January 25, 2017 Atlanta Braves invited non-roster LHP A.J. Minter to spring training. July 2, 2016 LHP A.J. Minter assigned to Mississippi Braves from Carolina Mudcats. June 9, 2016 LHP A.J. Minter assigned to Carolina Mudcats from Danville Braves. June 1, 2016 LHP A.J. Minter assigned to Danville Braves from Carolina Mudcats. May 19, 2016 LHP A.J. Minter assigned to Carolina Mudcats from Rome Braves. May 4, 2016 Rome Braves activated LHP Alex Minter from the 7-day disabled list. April 7, 2016 LHP Alex Minter assigned to Rome Braves from GCL Braves. September 30, 2015 GCL Braves activated LHP Alex Minter from the 60-day disabled list. June 22, 2015 LHP Alex Minter assigned to GCL Braves. 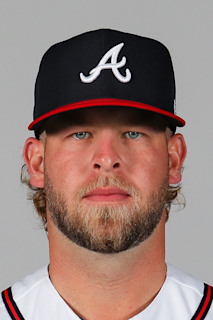 June 14, 2015 Atlanta Braves signed LHP Alex Minter.